Today was our first ever cookie decorating party. I’m not sure if it’s an experience I’ll repeat in the future. Ask me again in a few days. Right now, I’m so hopped up on sugar, that even the smell of these cookies is likely to just set me over the edge. 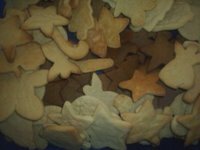 The Princess and I started our day early, baking what amounted to roughly eight dozen cookies – both sugar and gingerbread. We had invited about six of her friends to come over to decorate the cookies, and then take them home with them. To be honest, I wasn’t sure what I was getting into. I have always been a baking fiend – and when I was a kid, my mom’s friend used to invite me over to bake Christmas cookies (because my mom hates baking and just didn’t get into that sort of thing). I guess part of me was feeling nostalgic for those days – and part of me wanted to do something memorable for The Princess. Planning any event at this time of year is nuts. People’s schedules fill up early and completely – and I picked the date around one little boy’s preschool schedule. He’s The Princess’s best buddy – aside from our neighbor J, who was conveniently sitting in her first grade classroom at the chosen time (Yes, I did that intentionally – shhhhh, don’t tell my daughter). Unfortunately, the turn out was small (two neighborhood friends and their moms) – but it was actually a great deal of fun. One mom completely saved the day by realizing that popsicle craft sticks would be much easier to use for the spreading of frosting. She then quickly dashed home to get some. The kids had fun – we had three tubs of fresh frosting – white, red and green. Our topic choices were many: colored sugars, sprinkles, M&Ms, confetti, gumdrops, mini jawbreakers and frosting pens for writing. While we decorated, we munched on a bowl of scrap cookies (the broken ones that didn’t survive baking and removal from cookie sheet to the cooling rack), and laughed quite a bit. The kids enjoyed munching the goodies they dropped on the table I had wrapped in plastic (that icing is a pain to clean once it hardens!). After about 90 minutes, we had all grown tired, and we wrapped up the cookies and our friends left. We still have about 3 dozen cookies to decorate, and The Princess and Stepson will start fresh in the morning. Fortunately, our builders are taking advantage of unseasonably warm weather to work on our house tomorrow – so we’ll be sure to send them with a huge bag of treats. As for me, after 45 minutes on the treadmill tonight, I might have worked off a fraction of the scraps that I was shoving in my mouth all day. The kitchen has an overwhelming cookie aroma. And for now, the sight of frosting could set me over the edge. But… I haven’t ruled out next year yet.